Throughout the summer you may encounter many different types of wasps. These wasps can look similar at first glance but they often have very different natural histories and behaviors. While one wasp species might be aggressive and sting, another may be more interested in the food you're serving at your family picnic or the juicy spiders in your garden. The following descriptions are intended to help landscape professionals and gardeners identify a few common wasps and determine whether they require control or may be neutral or beneficial in your shared space. While adult eastern yellowjackets (Vespula maculifrons) feed on nectar and other sweet foods, they seek out protein rich foods to feed their grub-like young. They may carry insects or bits of meat from a picnic or trashcan back to their nests to feed their young. The nests are constructed underground and may house as many as 2000 individuals. Like honey bees, yellowjackets are social and their nests house queens, workers and drones (males). Early in the season these insects may not be aggressive, but as the season progresses and food sources become less available, yellowjackets may become persistent in their search for food and sting more easily. Their stings are painful and can be life-threatening for people with wasp or bee allergies. These and other yellowjacket species may need to be controlled if they nest in a high traffic area, a location where work needs to be done, or a location where children play. Wasps and bees are active during the day, so if nest control is needed, an insecticide labeled for wasps should be applied at night. Northern paper wasps (Polistes fuscatus) are a species you might recognize as the wasps that build a nest under overhangs or near outdoor lights on homes. Their nests are sometimes called "umbrella nests" because they often have a curved top with open comb-like cells on the underside. The nests are built in the spring by a few females but after a queen is established, the nest may grow to house as many as 200 individuals. Northern paper wasps forage for protein rich food like insects and bits of carrion, as well as sweet foods like nectar and fruit. Northern paper wasps are usually docile but may become aggressive if their nest is disturbed. Like eastern yellowjackets, they can be controlled if they become a risk to people in the area and should be controlled at night. Potter wasps (Eumenes fraternus) are solitary in nature. Each female builds a marble sized mud urn to house one or multiple offspring. The nests may be built on plants or on the sides of homes. The adult collects insect larvae or spiders and puts them inside the mud nest before laying one or more eggs and sealing the chamber. The young will hatch and feed on the stored food items until they emerge from the nest as adults. The adults feed on nectar from flowers. These wasps rarely sting people and may help remove caterpillars in the area. Black and yellow mud daubers (Sceliphron caementarium) are solitary wasps about 1 inch long. These wasps usually have an elongated and very slender attachment point between their abdomen and thorax. Nests are constructed using small amounts of mud carried from puddles or other bodies of water and situated in sheltered locations, including porches and building overhangs. These wasps are behaviorally similar to potter wasps, preying upon insects and spiders, then storing and sealing them in their nests for their developing young. The adult wasps feed on the nectar of flowers like Queen Anne's lace and rarely sting people. Cicada killers (Sphecius speciosus) are large wasps, about 2 inches long, with red-brown heads, black bodies and yellow banding on their abdomens. Females sting and paralyze cicadas, which they carry back to their subterranean burrow to feed their young. Females may sting people but this typically only occurs if someone attempts to handle them or if they are stepped on. These animals are sometimes confused with Asian hornets because of their large size, but they are a native species that rarely sting humans. Asian hornets are not established in North America. For more information about cicada killers, please refer to Issue 11 of the Home, Yard & Garden Pest Newsletter. Spider wasps vary in size but most are about ½ inch long. They are usually black, but may have a bluish shine, with transparent wings. Wasps in this group stun spiders with a venomous sting and are protected from the spider's bite by their hard exoskeleton. After stunning the spider, the wasp will carry it back to her burrow or mud cell to feed her single offspring. Adult wasps feed on the nectar of flowers or honeydew produced by aphids. Spider wasps are not aggressive but may sting if they are threatened or handled. 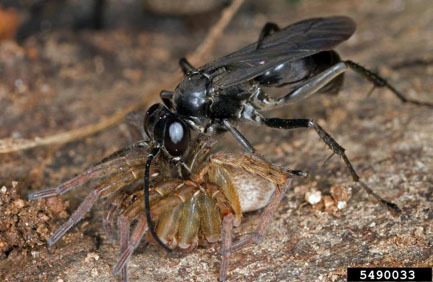 Spider wasp species in Illinois can have a mildly painful sting, though some species native to the Southwest (tarantula hawks) can produce a very painful sting. Give these insects a respectful distance if you are vacationing in the Southwest.